Many people put Divergent by Veronica Roth on their best lists last year, with a lot of them saying it was the new Hunger Games. I really should stop listening to praise like this, claiming something is as awesome as my Hunger Games, because they almost inevitably let me down. Divergent was good, and when the second book in the series comes out this year I will read it, but I did have some problems with it. In Divergent, people are put into factions based upon their personalities. It takes place in a future, rundown Chicago, with no information on what has happened to the rest of the world. I have no idea if Chicago is all that is left or if they are just really secluded, but in this Chicago everyone is placed into one of five factions and each faction runs a different part of society. Those in Candor are honest, so they take care of judicial positions. Dauntless are the fearless so they are the warriors. A person in Abnegation is selfless which is why they are the ones who govern. The Erudite are the teachers because they are intelligent and crave knowledge. And Amity, well, I don’t remember what they do, but they are the peaceful ones. Maybe they grow the food? I remember some scene where a truck was bringing back food from the Amity. The Amity didn’t take up much space in Divergent, so for now it doesn’t really matter what they do. In Divergent we follow Beatrice, an Abnegation-born-and-raised girl who doesn’t feel like she fits in with Abnegation. Luckily she is 16, the year she chooses which faction she wants to continue with, Abnegation or another. She and the other 16-year-olds are given a test to help them figure out where they may best fit, but ultimately it is their choice. The only problem with the test is that it is inconclusive for Beatrice, which means she’s Divergent, someone who doesn’t fit in just one faction but could be in many. Divergent people are dangerous, she is told, so her Divergent test result is hidden and she is told to hide this aspect of her personality. This was probably my biggest problem with Divergent. Factions based upon personality? So those in Candor can’t lie and would not be good teachers? And those teaching Erudites don’t want to be warriors? And those warrior Dauntless never just want to be peaceful? The factions were so strict. They are one thing and nothing else, and having tendencies of being something else is dangerous? I just had a hard time with these personality-based factions and the fact that everyone goes along with this, even the “factionless,” those who don’t fit in any category. Since they don’t fit in, they are shunned and homeless and starving, and this is just how it is. Really? I get that this is supposed to be a different, future world where society is transformed from what it is now, but I don’t think I have a good enough understanding of how they got to this point, so I couldn’t buy into it as much as I should have. 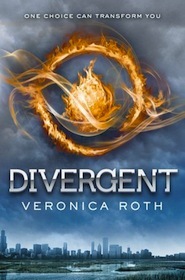 But I didn’t stop reading Divergent because it was still good, even with my reservations and questions, and the last half of the book was really exciting. Back to Beatrice. You could probably guess that she doesn’t choose to stay in Abnegation. She chooses Dauntless, but becoming Dauntless does not happen by mere declaration. She goes through brutal training, involving fighting and mind control, and at the end of training those with the worst scores will be out. They will be factionless and living on the streets. Her training was hard to sit through, but by the end of it, this faction-based world is starting to crumble and it gets very action packed. I was hooked. So is Divergent the new Hunger Games? Maybe that’s not the question we should be asking. Maybe we should all just stop saying something is the new something else. It really puts a lot of pressure on the new something, and it makes people like me compare them too much when I’m reading. So I won’t say that it’s the new Hunger Games and I won’t say that it’s not. It’s just Divergent, a dystopian novel that had me flipping the pages really quickly by the end, even if I didn’t completely buy into everything. And that’s okay because I can still say I enjoyed it. Just not as much as some other books I’m not going to mention anymore.